US-Saudi Arabia alliance: Cracks or overhaul of the global rule of law regime? The confusion and indecisiveness surrounding Jamal Khashoggi’s disappearance epitomises more than just hesitant international diplomacy. It raises important questions regarding the validity of the global rule of law regime, writes Yana Popkostova. Yana Popkostova is Founding director, European Centre for Energy and Geopolitical Analysis (ECEGA.EU). The US shale revolution will transform the traditional US thirst for energy and the compounding effect on its international relations into a global energy dominance, thereby curtailing the Saudi grip over US foreign policy and obviating the Carter doctrine’s determination to expel blood for stability in the Middle East. But the current Khashoggi saga dispels that mantra. 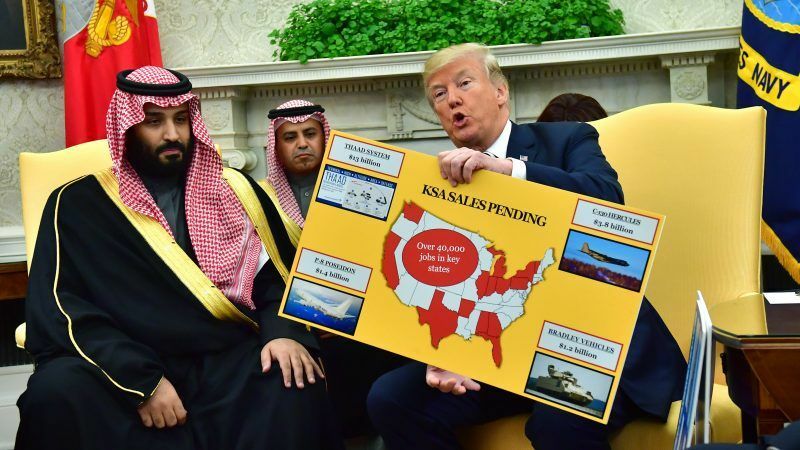 Saudi Arabia remains a strong shaper of US rhetoric and action, an actor that cannot be alienated for a crime that cannot be punished – and this is both shuddering a realisation and awakening to the reality of today’s realpolitik. Since the mercurial rise to power of MbS – the enigmatic Prince Mohammed bin Salman, US strategy for the region has hinged on his vision – for domestic economic transformation, ostracizing Iran, pushing against Isis and thus increasing the demand for US arms, crushing the clergy establishment while improving relations with Israel. Donald Trump’s first trip as an elected president was to Riyadh, a gesture full of symbolism about the power of Saudi Arabia to shape the Middle East geopolitics and the ability of the affluent kingdom to whittle the global hegemon’s path forward. Charming as he is, alongside an uplifting vision for Saudi transformation and regional role, the Saudi Prince presided over a blockade of Qatar, meddling with Lebanese politics, and a bitter feud against the domestic 1%, the bombing of Yemen and a humanitarian crisis, culminating in the imprisonment and mysterious disappearance [alas murder] of a dissident journalist. While the famished Yemeni kids never came to the shores of the European continent or featured on covers of acclaimed American journals, Jamal Khashoggi moves were recorded and publicized by the Turkish authorities – him entering the consulate, followed days later by cleaning ladies, never to go out. All business heavyweights decided to boycott the Future Investment Initiative [the Davos of the Desert conceived by MbS to attract foreign investment for the diversification of Saudi economy]. Blackstone, BlackRock and JPMorgan CEOs were followed by the CEOs of all major European banks and the IMF head in withdrawing from the programme. Business took the helm of policy leadership, upholding the values and social imperatives previously the prerogative of Western democracies. Harsh political reprimanding has been slow to follow. Trump mentioned “rogue killers” underlying the “flat denial” of King Solomon of any knowledge or order of a killing. The leader of the free world, the head of the cradle of rule of law and value-based foreign policy shrugged under his umbrella. With mounting pressure carefully orchestrated by Turkey’s Erdogan in his own Machiavellian regional games, the US administration hardened the rhetoric with Trump proclaiming that the Khashoggi case has been a “bad original concept…carried out poorly and the cover-up was one of the worst in the history of cover-ups”. ‘They should have done a better cover-up, and no macabre reports of body parts found in the Saudi general council’s garden will make me pursue punitive action’ is a freestyle interpretation of Trump’s remarks. A tentative allusion to ‘severe sanctions’ if ordered state murder is proven, was met with assertive stance by Saudi Arabia bolstered by a denialist narrative in its state-run media, all perpetuating what Jamal Khashoggi warned against in his last column: “uninformed or misinformed populations” where the “public psyche is dominated” by state-run media. The kingdom still holds the world’s most important spare reserve capacity, and its status of the global swing producer led to an unequivocal utterance that Saudi’s “influential and vital role in the world economy” will be used under pressure, words that reminded the Western world, safe in its hubristic belief that its system of legal approximation and soft appeal rules the world, that in fact it has failed. Amongst the noise of reporting and empty statements, Russia and China are notable by their absence – while the US attempts to conceive the truth, the EU observes as it does, and will, for sure, reprimand belatedly in the days to come [Germany already announced a freeze of its arms exports to the Kingdom and Mogherini asked for “a thorough investigation” in a dry statement about 10 days after the affair came to public attention], the bears of the East persevere in cushioning on arms and energy deals embracing the Kingdom, forming a new alliance of sorts, outside the global rule of law and principles system, in a realm of anocratic polities that are determined to reshape the regional power games. China and Russia, independently, but also in a somehow combined effort to sway the balance of power, have entered into energy, arms and aide relationships with everyone. Myriad deals with Saudi Arabia, Syria, Turkey, Iran, Egypt and Israel surpass bilateral trade numbers between the US and any regional actor, and largely eclipse the remit of the EU, marking the burgeoning new axis of power where “…the US monopoly is disappearing. It’s almost done.” as Putin stated during his annual foreign policy address. US power is waning, whether by design or lack of a solid strategy, but the effect will be long-lasting. The Khashoggi affair if anything demonstrates blatantly the changing geopolitics of the region and the realpolitik of power, where principles and values fade in importance. What is unfolding before a world duped in its belief in rule of law, is a flagrant disregard for legal approximation and basic principles of state action. This marks the sequence of the failed allure of Western values that catapults the liberal world into a Hobbesian grey zone where moral imperatives count less than arms deals, and where the dismembered bodies of journalists are hushed away as bad for business. “I don’t like the concept of stopping an investment of US$110 billion into the United States” “…here’s what’s going to happen — they [Saudi Arabia] will buy them from China, buy them from Russia.” “We’re not really hurting them, we’re hurting ourselves,” said Trump almost nonchalantly last week. “We continue to maintain a strong partnership with the kingdom of Saudi Arabia…Our shared strategic interest with Saudi Arabia will remain.” insisted his Secretary of State yesterday. The profound, emphatic logic of a reckless corporate leader [and his protege] of a brave new world that is shuddering, deprived of liberal values and impregnated by impunity, a world prone to bouts of demagogy, fake news and empty promises, where Europe remains silent [beyond one page written statements]. The end of history is not yet.